Formative assessment has recently become a focus of renewed research as state and federal policy-makers realize that summative assessments have reached a point of diminishing returns as a tool for increasing student achievement. Consequently, supporters of large-scale testing programs are now beginning to consider the potential of formative assessments to improve student achievement. The mission of this handbook is to comprehensively profile this burgeoning field of study. Written by leading international scholars and practitioners, each chapter includes a discussion of key issues that dominate formative assessment policy and practice today, as well as those that are likely to affect research and practice in the coming years. 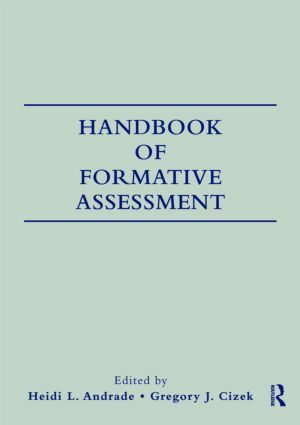 Comprehensive – nineteen chapters cover all aspects of formative assessment including classroom assessment, large-scale applications, technological applications, applications for special needs students, K-12 and post-secondary applications, psychometric considerations, case studies, and discussion of alternative assessment formats such as portfolios and performance assessments. Integrative – thoughtful attention is given to the integration of large-scale and classroom assessments. Practical – provides practical guidance on how to conduct formative assessments that generate credible information to guide instruction. Global – provides perspectives from leading international scholars and practitioners whose expertise spans diverse settings, student populations, and educational systems. Accessible Style – although grounded in the latest research, the book’s style and tone has been carefully crafted to make it accessible to both the textbook and professional markets. It will also be a critical reference book for researchers in teacher preparation, educational administration, and educational policy studies.